We looked at the top 10 Shark Vacuums and dug through the reviews from 55 of the most popular review sites including Consumer Reports, New York Times Wirecutter, Mashable, Best Reviews Guide, Tom's Guide, Wired and more. The result is a ranking of the best Shark Vacuums. Our experts reviewed the top 10 Shark Vacuums and also dug through the reviews from 55 of the most popular review sites including Consumer Reports, New York Times Wirecutter, Mashable, Best Reviews Guide, Tom's Guide, Wired and more. The result is a ranking of the best of the best Shark Vacuums. The Shark TruePet Lift-Away Upright Vacuum excels on hardwoods and carpets and is great for getting a deep-down clean, even if you've got pet hair to contend with. The canister can be easily separated from the floor tool, making it possible to clean under furniture. The only downside, however, is its weight. At over 15 pounds, navigating stairs could be a bit difficult with this product. DWYM Home Experts plus Nerd Wallet, Vacuum Cleaner Advisor and 4 more. Along with user reviews from Best Buy, Amazon and Walmart.
" The Shark Rotator NV752 particularly shines in its performance on carpet, hard floors and stairs and in efficiency (ease of cleaning, noise level and suction). The Rotator delivers what’s arguably most important in a vacuum: consistent performance across floor types...."
"Hard floor genie is only adequate and shorter folks may find the handle too long." DWYM Home Experts plus New York Times Wirecutter, Consumer Reports, Top Ten Reviews and 3 more. Along with user reviews from Amazon, Home Depot, Target and Walmart.
" It is great at grabbing most debris (including pet hair) from most kinds of floors and swiveling joint makes it easy to steer." "The on/off switch is inconveniently placed. It requires manually emptying the bin, which is messier and sometimes presents problems for those with allergies or other respiratory issues and lacks a manual carpet-height adjustment, which is better than automatic systems at..."
The Shark Rocket DuoClean is a standout for its ability to transition between different types of flooring and pick up all types of debris, from pebbles to dust. Its LED lighting features also make it easy to see under furniture as you clean, making the process a little simpler. However, the vacuum does not stand upright on its own, which may impact how it gets stored. DWYM Home Experts plus Best Reviews Guide, Consumer Reports, Best Products, Vacuum Cleaner Advisor and 6 more. Along with user reviews from Amazon and Walmart.
" Lighweight, good suction and eaasy to clean and maintain"
"No HEPA filter and will not stand upright." This vacuum gets gold stars for being easy to maneuver and great at picking up whatever you need. The attachments go on with ease, so you won't lose time trying to figure out how to switch between the tools you need. The only downside? The canister for collecting debris is a bit small, so cleaning your entire home may require emptying the bin frequently. DWYM Home Experts plus and 2 more. Along with user reviews from Best Buy, Amazon and Target. We identified the majority of the shark vacuums available to purchase. Reviews from our DWYM category experts and analysis of some of the most respected sources including: Consumer Reports, New York Times Wirecutter, Mashable, Best Reviews Guide, Tom's Guide. We also incorporate user reviews from the leading retailers including Amazon, Best Buy, Walmart, Home Depot, Target, Google Express. This vacuum is very good at picking up pet hair. It is easy to maneuver, not too loud and easy to empty the dust canister. 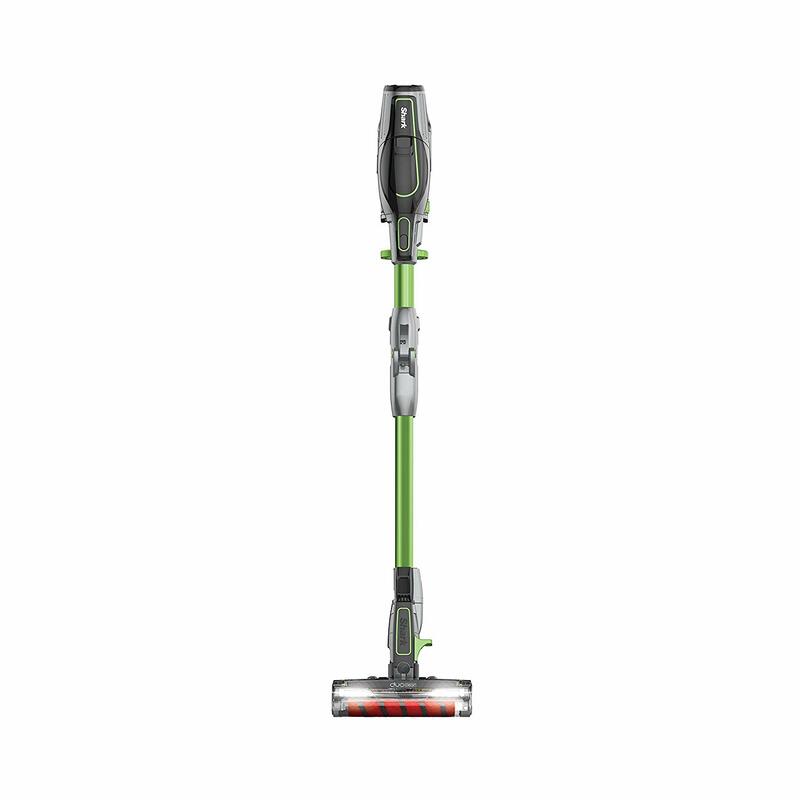 The NV752 TruPet gives you a combination of a lightweight upright along with a detachable lightweight canister vacuum (with powered brushroll). Never loses suction Technology gives this vacuum consistent suction power. Hard floor genie is only adequate and shorter folks may find the handle too long. It is great at grabbing most debris (including pet hair) from most kinds of floors and swiveling joint makes it easy to steer. It requires only 10 amps – save a lot of electricity and the suction is better than the Hoover’s 12 amp motor when running. Also, it is able to convert to a light canister which is very portable or still on the rolling nozzle base. The plug-in vacuum—not as convenient as a cordless. The on/off switch is inconveniently placed. It requires manually emptying the bin, which is messier and sometimes presents problems for those with allergies or other respiratory issues and lacks a manual carpet-height adjustment, which is better than automatic systems at matching the brush to the surface. Finding the perfect vacuum cleaner for your home can be easier said than done. But, if you’ve already decided on the brand you’d like, you’re halfway there. Shark is a leading name in the household appliance industry. So if you’ve selected this as the brand you’d like to bring into your house to help keep things tidy, you’ve chosen well. However, there are many different types of vacuums under the Shark name, so now it’s time to compare a few to find out which one really is the best one for you. For example, the Shark TruePet Canister Upright Vacuum was voted as the best overall when examining the brand’s top products. However, if you don’t have pets and therefore a ton of hair to pick up all over the house, this may not be the option for you. In that case, you may want to go for the best value, which likely means you’ll walk away with the Navigator LiftAway Vacuum. This model is easy to maneuver and works on a variety of surfaces, including hardwoods, carpet and more. There’s much to be considered when shopping for a vacuum, but the good news is that Shark has a lot to offer. So, whatever your needs may be, there’s bound to be a machine that will get the job done — a highly rated machine, at that. Stick around and we’ll get into the nitty-gritty (pun intended!) of what makes each of the four top-rated Shark vacuums so great. In the process, you’ll discover exactly what your home needs from a vacuum cleaner in terms of pick-up power, maneuverability, storage and more. Then, you’ll be well on your way to maintaining a tidy space once and for all. Here’s to finding the Shark vacuum that will work for you. After all, when it comes to keeping your home clean, only the best will do! Despite the fact that the vacuum was originally invented in 1860, Shark vacuums have only been around since 1998. Yet they’ve quickly managed to become one of the most well-known brands in this category. This likely has something to do with the fact that the company prides itself on providing items that “fit the lifestyles of busy people” in order to “positively impact- people’s lives every day.” How could you not support a company with those kinds of values? The Shark company also owns Ninja, the well-known kitchen appliance brand. So the company definitely understands what you need in your home and is constantly looking to grow to be ahead of your needs and wants. While it may not be the obvious thing to consider when purchasing a vacuum cleaner, how much the machine weighs should definitely play a role in your decision. If you’re going to be lifting this thing up and down stairs to clean multiple levels in your home, you’re likely going to want something that’s lightweight. In that case, look to the Rocket DuoClean or the Rocket Complete Ultra-Light models to make things easier on yourself. Be sure to think about where you’ll be storing your vacuum when it’s not in use. The bigger and bulkier the machine, the larger the closet or space you’ll need to make sure it’s not in the way until you need it. If you’ve got a large laundry room or closet to store your machine in, the TruePet Canister option could work great for big messes in your home. If you’re in a smaller space, however, a large vacuum might feel like clutter if not properly put away. So be sure you know exactly where your vacuum will “live” in your home before making a purchase. While you’re definitely more focused on how a vacuum will keep your space clean, you’ll also have to think about what is required to keep your vacuum clean and operating at its best. A canister vacuum, such as the Navigator LiftAway model, makes it easy to tell when it’s time to empty the canister so that there’s plenty of space for sucking up debris and more. You’ll never have to guess when it’s time to empty what your vacuum’s collected so far, as you might with bag vacuum models. You’ll definitely want to consider the type of suction power you need for your home. Do you have carpets? Pets? Kids? All of this will come into play when choosing the best machine to keep things clean. The TruePet Canister Upright and Navigator LiftAway models are great for heavy-duty types of cleanup. Meanwhile, if you’ve got a smaller apartment with tiled floors, a heavy duty vacuum with tons of suction power may not be necessary to keep your space in order. The types of messes you clean up most often will dictate your needs here. The surfaces your vacuum will encounter also matter. Will it be transitioning from tile to carpet as you move from room to room? If so, you’re going to want something that will easily adjust to the different needs for picking up on a smooth surface versus one that can trap dust and debris. Models such as the Navigator LiftAway and the Rocket DuoClean are great if you’ve got multiple types of flooring throughout your home. They’re made to transition from room to room and offer versatility, attachments and more to suit your needs. For the Shark Vacuum category, we analyzed 55 of the most popular reviews including reviews from Consumer Reports, New York Times Wirecutter, Mashable, Best Reviews Guide, Tom's Guide, Wired and more. The result is a ranking of the best Shark Vacuums.